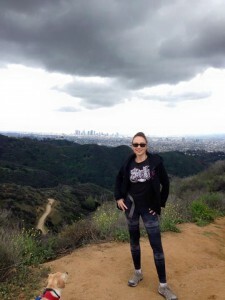 The Hollywood Sign Hike is my favorite hike in Griffith Park. 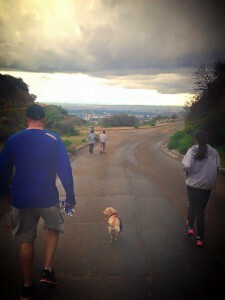 It’s one of my favorite hikes in all of Los Angeles. It’s not that long of a hike, but its strenuous for some and it can be more challenging in the summer heat. I discovered on this weekend, that it’s actually more fun in a Los Angeles rainstorm! 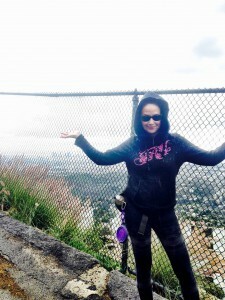 Allow yourself about 2 hours to accomplish this hike at a leisurely pace. 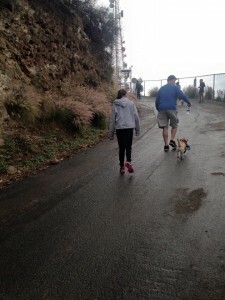 The hike to the sign is a quick climb, however, you can’t park close to any Griffith park gates. The hike to the sign is on Mt. Lee Road and it can be at least a 20 minute walk just to get to the road. There are little trails attached to Mt. Lee Road. If you have the time, go ahead and explore these trails. They tend to be less crowded. The views are just as amazing! 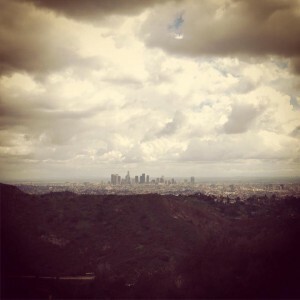 Beautiful images of Los Angeles can be captured from most spots along the way, up to the Hollywood sign. Be sure to stop every so often and take a look around. You might miss a wonderful moment! Don’t forget your camera! 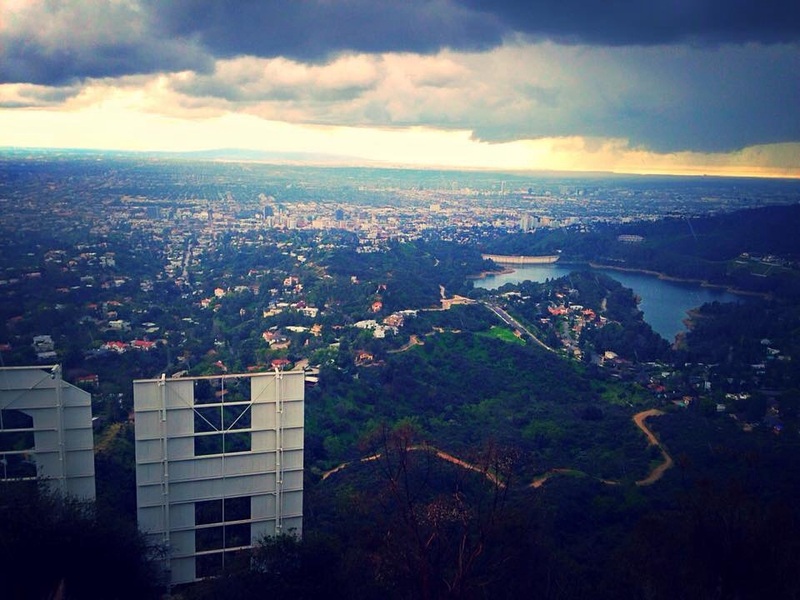 It was pouring rain when I got to the top of the Hollywood Sign. Always dress appropriately when hiking. Check the weather forecast, no matter the time of year. You don’t ever want to get caught off guard, when it comes to weather.. heat, rain, cold. Always bring water. You will find many dogs on Mt Lee Road. It’s safe to have your dog off leash for the hike. But always have a leash handy, because there are service cars that pass through regularly. Always have water for your dog. There are no baggies available here. Bring your own bags and always pick up after your dog! 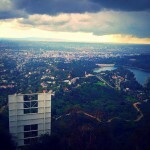 An awesome Hollywood sign view, on our way back to the car. This photo was taken on Mulholland Highway, which is a closed off dirt road, just outside of the Griffith Park gate. We choose to park on Canyon Lake Drive, which is up the street from Lake Hollywood Park. At the top of Canyon Lake Drive, you’ll find Innsdale Drive. To the right, you’ll find a dirt road that’s closed to cars. Take the dirt road for a 10 minute walk. The dirt Road hooks up to Mulholland Highway. Go left on Mulholland. Stay to the left for a 5 minute walk. Mulholland becomes another dirt road. Walk for about another 10 minutes. Mulholland Highway will then connect to the Griffith Park gate. Go through the gate and you’ll be on Mt. Lee Road. Follow the road for a short while. There will be a fork in the road. Go left and head up the hill. 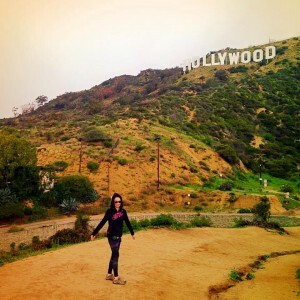 Follow the road up to the Hollywood sign. Bring a map, in case you get lost. The roads are winding and some may find the area to be confusing. Enjoy! In spite of all the new parking restrictions all around the surrounding neighborhoods and the rainy (frozen rain!) weather, the trail was quite busy on Sunday. All the hikers were in good spirits and there were dogs a-plenty. It’s a very busy trail, but everyone should experience this hike, at least once! Thanks! Glad you like it, Video guy!